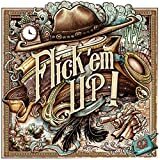 Flick 'em Up! can be played on most flat surfaces, big or small: table, floor, etc. The surface you choose must allow the pieces to slide well and must be accessible from all sides. The surface must also have sufficient space to place all the necessary pieces. There are 10 scenarios, each of which provides an original adventure and a new town of the Wild West for you to discover. Each scenario is explained in detail, including any additional rules required to enjoy the adventure. 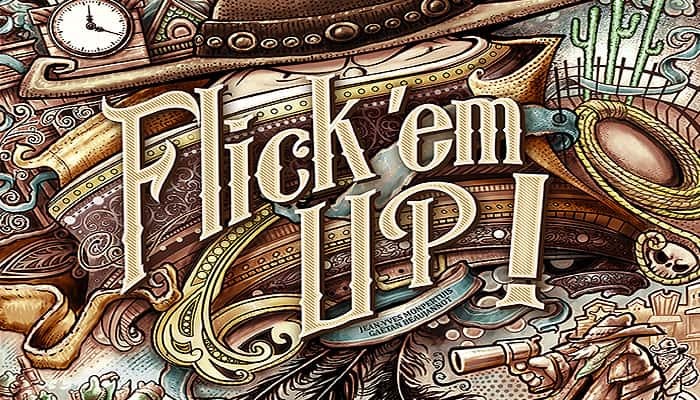 Flick 'em Up! may be played by 2 to 10 players. The players should be divided into two equal teams. Each player will either be on the lawmen's team or the outlaws' team. When playing with an odd number of players, one of the teams will simply have an additional player. For example: in a 5-player game, one team will have 3 players, and the other will have 2 players. Each team has a box (black or natural) with 5 numbered spaces. Place a Cowboy tile in front of each of these spaces. These spaces correspond to the numbers on the hats worn by that team's cowboys. 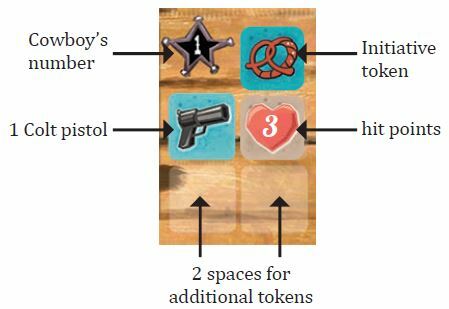 Each cowboy's inventory depicts one pistol (default weapon), a space to stack that cowboy's hit points, and spaces for two additional tokens. Place these boxes near the play area, just outside of town. Once you have chosen a playing surface, a scenario, and your teams, you are ready to start! The game is played in successive rounds. Each round corresponds to one hour on the Town Hall's clock. A round is over once all cowboys from each team have played. The scenario indicates the starting time for the clock, which side of the cowboys' hats should be faceup, and which team will play first. A cowboy is considered available when the color of its hat corresponds to the color of the round (on the clock) in progress. Once a cowboy has played, its hat is flipped to the opposite side. That cowboy is no longer available in this round. When there are no remaining available cowboys, the clock hand is moved to the following hour, and a new round begins. Example: The game begins with the Town Hall's clock set at 6:00. As this is a red hour, all the hats start red side up. All available cowboys will play in this round. Once a cowboy has played, their hat is turned blue side up. Once all hats are blue, the clock hand is moved forward to 7:00, a blue hour. A new round begins where all cowboys with blue hats will play. Before beginning, each of the two teams will determine their own independent turn order. Who will play first, second, etc. Once all players on a team have played, the turn order begins again with the team's first player. 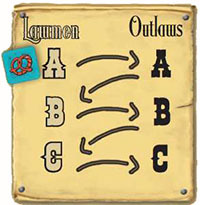 Each scenario begins by playing the cowboy with the initiative token (specified by the scenario). The first player of that cowboy's team must play this cowboy. Then, the first player of the other team chooses one of his team's available cowboys to play. Players continue taking turns, alternating between teams, until all available cowboys have played. Each subsequent new round begins by playing the cowboy with the initiative token. The next player in the turn order of that cowboy's team will take the first turn c the new round. Keep in mind that it is possible for the initiative token to change hands from one cowboy to another (explained later). It is therefore possible for a team to take two turns in a row by taking the last turn of one round and then taking the first turn o the following one. In a game with an odd number of players, play between teams alternates in the same way as with even players. Play alternates from one team to the other. In this way, play passes from team 1 to team 2, then again to team 1, etc. Each team follows its respective turn order: first player, second player, etc. When a player plays a cowboy, he may take two actions with it. A player takes two actions of his choice, in the order of his choice. The player may take the same action twice. The player may choose to take only one action, or none at all. Regardless of what the player chooses to do, he must flip the hat of the cowboy he played once he is finished with his turn. Most of your actions will involve flicking, as that is how players will both move and shoot. A flick (in this game) is performed as illustrated below, with a finger but without the resistance of your thumb (weaker, but more controlled than a standard 'flick'). Players will move cowboys for a variety of reasons, such as holding a better position or to enter a building. Once a player has chosen to move a cowboy, he replaces the cowboy with the movement disc. The player then performs the movement by flicking the movement disc (in the manner described previously) in the direction he wishes to move. The moved cowboy is placed at the exact space occupied by the movement disc. Once placed, the cowboy may be oriented in whichever direction the player chooses. The movement is failed and the action is lost. The moved cowboy is returned to where the movement attempt was initiated, oriented in whichever direction the player chooses. If the player has an action left, he may use it to attempt another move. Any objects, figures, or buildings that were displaced by the movement disc are returned to the positions they occupied before the movement attempt. To enter a building, a player must choose the move action, and attempt to flick the movement disc between the two support blocks of the building he wishes to enter. In this case, touching the inside section of a support block with the movement disc is allowed. 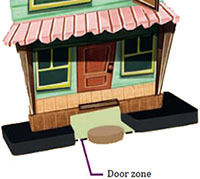 The cowboy succeeds in entering the building when any portion of the movement disc has passed the line which designates that building's door (see illustration). 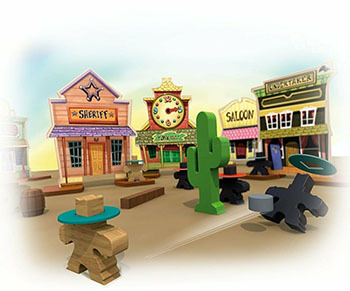 Upon successfully entering a building, the player places the cowboy on one of the building's two support blocks. To exit a building, the player chooses a move action, places the movement disc behind the building and attempts to flick it through the support blocks. The cowboy succeeds in exiting the building when the entirety of the movement disc has passed the line that designates the building's door (see illustration). In this case, touching a support block with the movement disc is also allowed, however all other movement rules apply (e.g., touching objects or figures). Important: If a building's entrance becomes blocked by an object, that object may be moved to one side or the other to permit entry into the building. Each cowboy has a gun which he can use to fire at the other team's cowboys, to make them lose hit points. Once a player has chosen the Shoot action, he places a bullet (gray disc) to the left or right of his cowboy, at the distance of one bullet (gray disc). The player then fires by flicking the bullet (in the manner described on page 5) at an opposing cowboy. If the cowboy doesn't fall over, then the bullet simply grazed him without effect. This is a miss. If a bullet hits two or more cowboys, only the first one is considered to be hit. The others are immediately stood back up. A cowboy inside a building may only be hit during a duel (see Scenario 2). The cowboy is injured and loses a hit point. The hit point is placed in his team's box. The cowboy remains fallen. He will stand up the next time he is played. A fallen cowboy cannot be hit by another bullet (or dynamite). He may only be hit once he is standing again. If a cowboy's hat falls off, simply replace it so that it shows the same color as before. Hitting a teammate has the same effect. Bad luck! The cowboy figure and his tile are returned to the game box. They are placed in his team's box. The objects in possession of that cowboy are placed on the support blocks of the Undertaker's building. The hat of that cowboy is placed on the box space corresponding to that cowboy, so that the faceup color is the same as it was on that cowboy. This cowboy's hat will still be used during each round (see below). 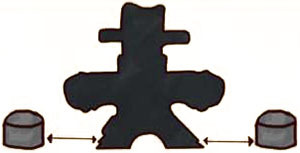 If the dead cowboy had the initiative token, this token is placed on the box space corresponding to the cowboy who shot the bullet. Important: In order to ensure that each team is playing the same number of turns each round, the hats of dead cowboys remain in play. When a cowboy loses his last hit point, his hat is placed in his inventory without changing its color. This cowboy's team will continue to play this cowboy in each round. A dead cowboy has no actions to spend. The only function of playing a dead cowboy is to pass a turn; after doing so, flip the cowboy's hat to the opposite side. The game elements (barrels, buildings, etc). displaced by the bullet or by other game elements remain in these new places. If a cowboy has 2 or more pistols, he may shoot 2 bullets with one action. To do so, the player places a bullet on each side of the cowboy and flicks them one after the other at the target(s) of his choice. A cowboy carrying 3 pistols may not shoot 3 times. It is also possible for a cowboy inside a building to shoot. To do so, the player places the bullet behind the building and aims it at the door (between the 2 support blocks) of the building. All rules regarding the shoot action apply in the same manner as described above. When he is inside a building, a cowboy may use an action to take or drop a token (weapon, dynamite, document, etc). When a cowboy takes a token, it is placed in that cowboy's inventory. When a cowboy drops off a token, it is removed from that cowboy's inventory and placed on the support block of the building that cowboy occupies. Certain scenarios may have additional rules regarding specific tokens. A cowboy may hold up to two tokens. If a cowboy takes a third token, it must be exchanged with another token in that cowboy's inventory, so that the cowboy continues holding only two tokens. This exchange only costs one action. If a cowboy wishes to take a facedown token, he picks one randomly among the pile and flips it over, and may then choose to take it or leave it in place (faceup). His action is used, regardless of whether or not he keeps the token. One of the scenario's victory conditions has been met. The town hall clock strikes 12:00 (midnight or high noon).